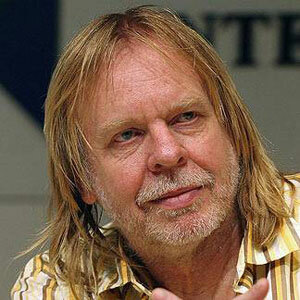 Rick Wakeman is proud to call himself a Freemason. 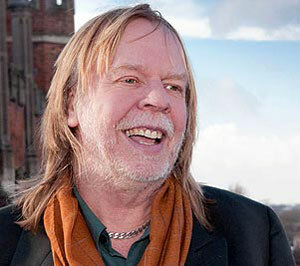 Legendary keyboard player and rock musician, Rick Wakeman, visited Wellington, Auckland and Christchurch as he took his show “An Intimate Evening With ...” on a whirlwind tour across the southern hemisphere. 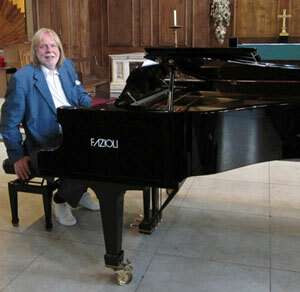 The one-man show featured Rick accompanied only by his grand piano, upon which he performed several of his classic compositions, annotated with anecdotes from his long career, as a classical pianist, a session musician (to such luminaries as Cat Stevens, David Bowie and Elton John), as member of The Strawbs, a composer and member of the progressive rock band ‘Yes’, and as a solo performer. 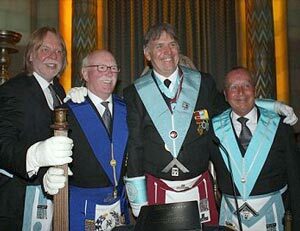 In spite of his incredibly tight schedule, he agreed to meet with ‘Degrees South’ magazine editor, Richard Taylor, to share his views on Freemasonry and his experiences as a member of Chelsea Lodge No. 3098 E.C. Me and a piano. What else do I need? Rick’s one-man show ‘An Intimate Evening with Rick Wakeman’ toured Australasia. 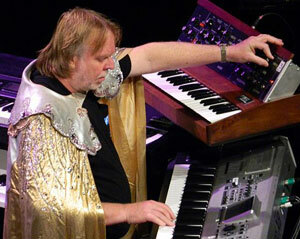 Keyboard wizard Wakeman works his magic on a Moog. Bro. Wakeman (Left) has recently become the Junior Warden of Chelsea Lodge No. 3098 in London. The Chelsea Lodge meets officially five times a year but it holds 42 LOI’s! They work the Logic Ritual, and this demands a very high level of competence, particularly in floor work. Famous for their charitable giving the Chelsea Lodge has raised over £100,000 (NZ$200,000) in the past five years and this is one aspect of Freemasonry that appeals to Rick. He went on to quote many examples of the Lodge coming to the aid of members, while supporting a wide range of charities including, the London Masons Cyberknife Appeal; Prostate Cancer; Brain Tumour UK; Mercy Ships and The Forces Children’s Trust. The Lodge also contributes an annual bursary to the Sylvia Young Theatre School. Much of the money is raised through ‘The Chelsea Lodge Road Show’, a loose grouping of Lodge Members who will attend a Lodge meeting and give a talk on the history of Chelsea Lodge followed by a cabaret at the Festive Board. Rick went on to talk with some affection of the current WM of Chelsea Lodge, W.Bro. Mick Abrahams. Mick Abrahams was the original guitarist with the band ‘Jethro Tull’ and went on to form ‘Blodwyn Pig’. Two years prior to his Installation, at the age of 65, he suffered two heart attacks and a mid-brain stroke. Thus struck down, he has had to learn to both walk and talk again. Mick was, however, determined that his installation should go ahead, as were the other Lodge members. He stayed focused on his recovery and, eventually, was able to walk unaided up to the pedestal to take his obligation. Chelsea Lodge currently has five candidates awaiting initiation, another six or seven with their Second Degree pending, and five more ready to be raised. Rick has four sons and would not be surprised if one or two of them followed him into the Craft. 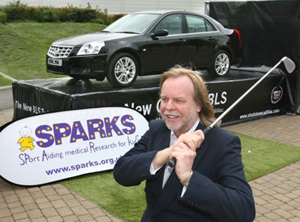 Rick is pictured giving up some of his spare time at a SPARKS Pro-Am golf day fund raiser. SPARKS is a very worthy, UK-based, infants’ health charity. When time permits, Rick makes a point of visiting other Lodges and will often take an acting office where the Lodge might be struggling in terms of numbers. He feels that often a Lodge might need a helping hand through a quieter period, hopefully to recover as more candidates come on board. He is also a Royal Arch Mason as well as having joined the Knights Templar. Both orders, he believes, hold synergy with his strong Christian faith. Rick was also eager to hear something of the history of the South Island District and of the Lodges therein. Consequently the interviewer became the interviewee and our allocated half hour session drifted into one hour, resulting in a very harassed promoter calling time on two aging rockers’ reminiscences. Copyright: © Degrees South magazine – Used with permission.